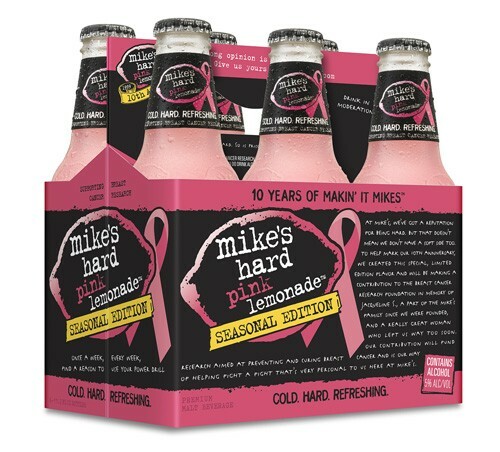 Mike’s Hard Lemonade and Chamborg liqueur are 2 big name alcohol makers who’ve attached their marketing message to a promotion for breast cancer research – but since even moderate alcohol consumption is proven to increase a woman’s risk of breast cancer, many are questioning the appropriateness, and even the sincerity, of the informal partnership. October is breast cancer awareness month. You can now buy a Mike’s hard lemonade in pink and on the package you’re told that your purchase helps to support breast cancer research - and the Chamborg liqueur marketing team urges you, “to pink the drink” saying that by adding a splash of Chamborg to any cocktail you make you help to support year round breast cancer research funding. Since alcohol consumption is a proven cause of breast cancer, many cancer survivors and breast cancer advocates are angry that big-alcohol is using cancer to sell ever more of what causes it. Is this good corporate citizenship or a very inappropriate leaching onto a good-will cause to boost sales? Mikes Hard Lemonade CEO Phil O'Neil says their breast cancer donations are made in honor of an employee named Jacqueline who died after a year long fight with the disease. In a statement, O’Neil attempted to refute critics by saying, "The donations we make to breast cancer research are not tied to sales; they are our way of honoring Jacqueline," The company has so far donated a half million dollars the cause. Not everyone, however, is sold on the good-will message. Dwight Burlingame, of the Center on Philanthropy at Indiana University argues that far from philanthropic intent, that, "These businesses are promoting their product."